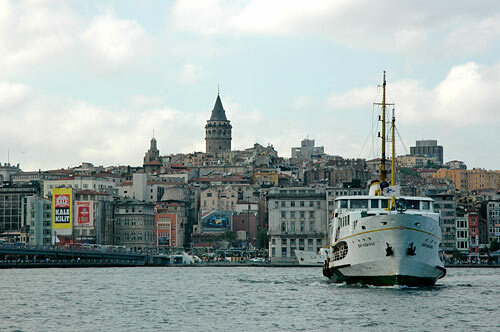 For a long time I wanted to go to Istanbul, to visit this city in charge of history for thousands of years. From a funicular point of view, Istanbul is quite as in charge of history since always circulates in its centre one of the oldest funiculars in the world. Not only it is a funicular but it is seen as one of the oldest subways in the world after that of London in 1863 and New York in 1868! But let us not forget also the ' Ficelle' of Lyon, underground funicular from Rue Term to the Croix-Rousse, which functioned of 1863 to 1967! Besides, it is the ' Ficelle' of Lyon, the first French subway as old as that of London, which was used as model for the first funicular of Istanbul, Tünel! 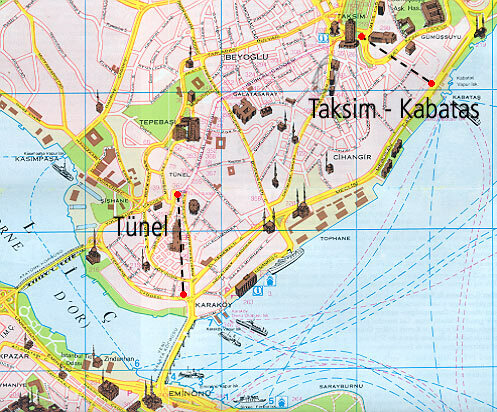 130 years after the startup of its first funicular, Istanbul will see the opening of a second funicular at the end of 2005 which will also connect, like Tünel, the bank of the Bosphorus to the district of Beyoglu: Taksim - Kabatas. The Galata Tower on the Beyoglu hill..
Istanbul Elektric Tramway ve Tünel (I.E.T.T.) is the national company which is in charge of the public transportation in Istanbul: bus, metro, tramway, light railway, nostalgic tramway and Tünel. The map of Beyoglu transportations, in red the two funiculars. Beyoglu and the Golden Horn.